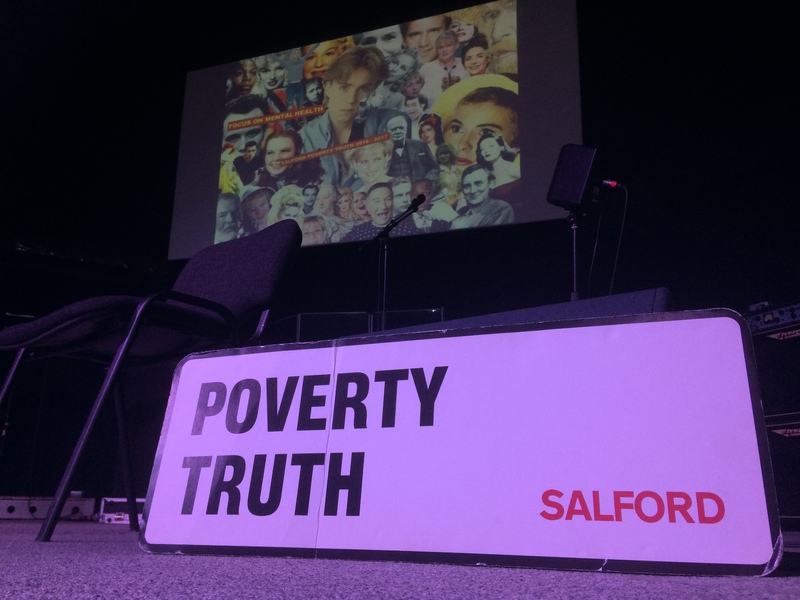 What if people living in poverty could take the lead in challenging Salford’s leaders to work with them on tackling poverty? Would it make a difference to the decisions that are being made? Would new solutions be discovered? Would people listen and, if they did, would they better understand the challenges that poverty brings? Dozens of people from across Salford and around the country gathered at The Sanctuary in Dallas Court. The crowd included Salford residents, people who work in the city, people with personal experience of poverty in Salford, and people involved in similar projects elsewhere in the country. The event included poetry, drama, a mass rendition of Man In The Mirror, and moving first-hand stories of what the commission had done, and what it had meant. Poverty Truth Commissions (PTCs) are still a relatively new approach to addressing poverty at a local level. Nine have been (or are being) set up, and of those Salford is the third furthest forward. PTCs consist of people who have personal experience of poverty, and a matching number of people in business or public life, whose positions might enable them to help make changes happen. The PTCs focus on three broad areas, and meet monthly, coming up with proposals that can help to make a difference. The Salford PTC began with 30 people, evenly divided between the two definitions, but commissioners on Friday told how they had united into one close-knit group, forming friendships and, only then, starting to draw up ideas that might make Salford better. Laura Kendall and Tom Tasker compered much of the event. Laura said she had initially been wary of getting involved in the PTC but had decided to give it a go and was glad she had. Patrick Philpott told of having seen huge changes in Salford, with the demolition of much of the old housing, and said the approach of the PTC could help bring back real community spirit to the city. He said the commission had been one of the most powerful projects he had ever been involved in. Alain Bougan told how he had fled southern Cameroon, fearing for his life, and said the PTC had meant community, friendship, support and the opportunity to gain new skills and qualifications. City council director Debbie Brown said she had been devastated when she saw a diagram in which people had identified the council as a cause of poverty. “I was taken aback,” she said. Since that moment, the commission has achieved much, including revolutionising the way that the city council speaks with, writes to and meets with residents. It has launched new face-to-face coffee drop-in sessions for people seeking help or advice, it has stopped using enforcement agents for council tax collection, it has re-written its standard letters to prevent “brown envelope syndrome” and it has given tax exemptions for more young people. The council has also waived charges for copies of birth certificates for homeless people, enabling them to more easily obtain the official ID they need to access benefits. Angela Penny Barratt told how that change had come about and said the idea is now being discussed across Greater Manchester and in London. At each table, a ‘reserved’ seat was set aside. Pete Sims said that was so people would think of those who might be involved in the next stage of the ongoing work in Salford, and to ensure inclusion. Before the spectacular musical finale, the Bishop of Salford, John Arnold, and Salford City Mayor, Paul Dennett, gave closing remarks. Mr Dennett praised the work of the PTC and also the approach. “Politics is either done to us, or we shape it,” he said. PTCs are a powerful way for people to choose that second option. The PTC met homelessness support agencies, aiming to create more referral points in Salford. Until now, people have had to walk from Salford to Manchester to be referred back to the Narrowgate Night Shelter back in Salford. Salford City Council has launched new face-to-face drop-in sessions, where people can discuss financial problems with staff in confidence, over a cuppa. Representatives from CAB, Six Degrees, Salford Healthworks and Work Choice will also be there.